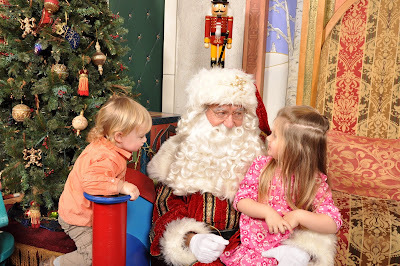 Dylan barely noticed Santa; don't you see that choo-choo? Abbey wanted to make sure, "Dylan wasn't too scared of Santa. Haha, so cute. What a difference a year makes. I love those pictures!! I wish that Andrew was just as happy as Dylan around Santa. He didn't want much to do with him. I love this. So much. 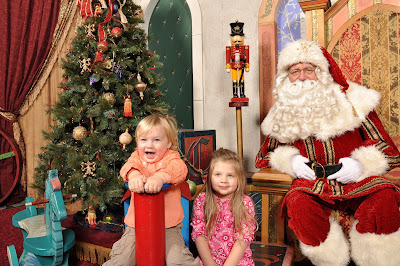 For some reason, we hardly have any surviving pictures of the kids on Santa's lap. Maybe two out of all the years. My sister on the other hand has every single year of her boys (beginning with just the one, then the two of them) until they got too big. Same Santa. Same location. Different little boys by leaps and bounds. Her kids are now in high school and over six feet tall and I'm sure that particular Santa is long gone. But she has a photo tree with all the shots of them side by side that she puts out every year. I'm jealous. And oh so happy for her. Love love love!! Thank you for linking up. So they do warm up to him eventually? Whew! OOOH my heart...look at how cute they look. I love it. Santa is wonderful and their little faces are melting me. Those are too precious. It took 3 years of coaxing for my son to get comfortable enough to see Santa...ok it was a threat. I told him that Santa wouldn't bring him any gifts if he didn't tell him what he wanted. Yea, I'm a good mom like that. So cute! I love that you did then and now! Cute to see how happy he was about the train instead of Santa. Isn't that funny? He cried when we had to leave the stage for the next people. He loves trains. Thank you! They did a pretty good job. Well, until we had to leave. Giggle. It will be a funny story one day-the Santa threat! It's a great Santa. It's in the middle of a mall, too, but you would never know from the pictures. I like that it's vintage-y, too. Isn't it crazy that it's in the mall? Abbey was pretty motivated; she really wants a new doll. Thank YOU for hosting such a fun linky. I'm enjoying seeing everyone's photos.